Two scientists at the Thomas E. Starzl Transplantation Institute at the University of Pittsburgh discussed the state of xenotransplantation—the use of cells, organs, or tissue from one animal in another—in a review in The Lancet. In that review, they touch on the history of one particular subject: pig-to-human transplants. Their conclusion? 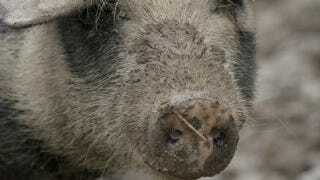 Clinical trials of pig-to-human transplants could begin in just a few years. Pigs that are genetically modified with genes to protect their organs and other inside bits from attack by the human immune system are capable of all kinds of potentially life-saving effects. Research has been conducted until now with non-human primates, and while these primates have not been able to survive for all that long with pig organs—at best, a pig heart-implanted primate survives for around eight months—that could be enough time to serve as temporary lifesavers. Cells and tissue could be used to counteract human diseases like diabetes (as in this example) and Parkinson's, and have actually shown more success than complete organs. With new genetically modified pigs becoming available that are likely to improve the outcome of cellular and corneal xenotransplantation further, we believe that clinical trials will be justified within the next 2-3 years. No safety concerns that would prohibit such clinical trials have been reported...With regard to pig tissues and cells, as opposed to organs, it would seem that clinical xenotransplantation could soon become a reality. The scientists believe that soon enough, genetically-modified pig organs could be even more capable than mechanical versions, which is surely great news for those who need them.